Evonouk Farms sold out of their herb packs, but had all of this for free! 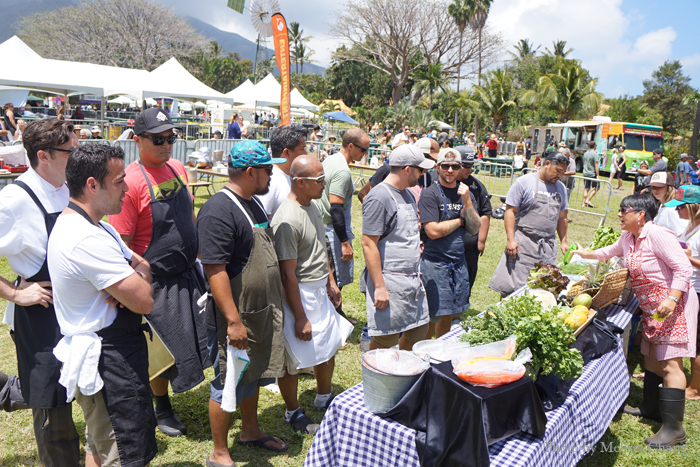 Every year on the first Saturday in April, Maui has its big agricultural festival — a celebration of the amazing and abundant products from the Valley Isle, showcased by some of their most talented chefs. 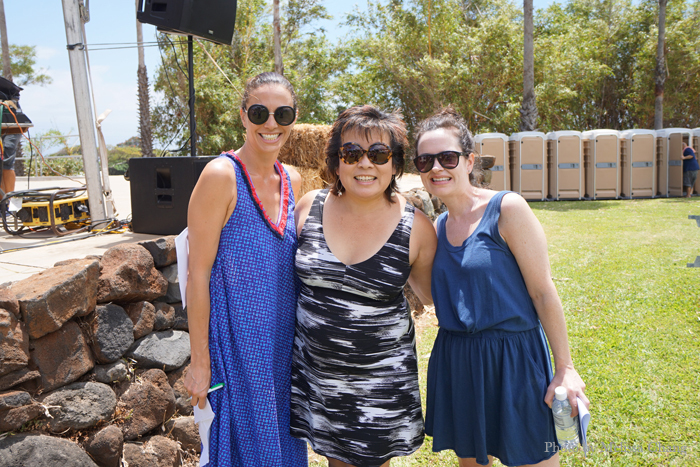 It’s my favorite event on Maui, and although the Hawaii State Farm Fair is my client, I have to say it’s even better than that. 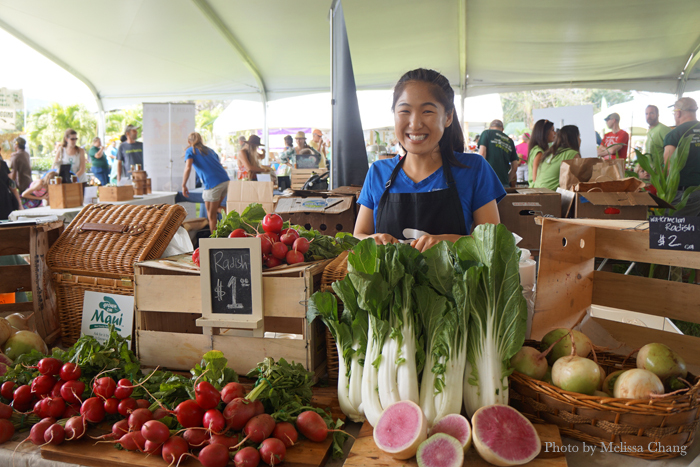 Every island has agriculture, but Maui has more of it compared to Oahu. 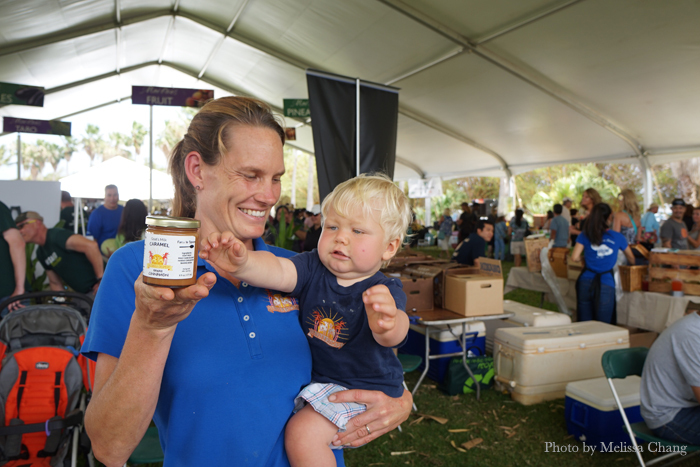 And many of the chefs there have done farming, fishing and ranching at some point (some may still be into it) so they know exactly how each ingredient is produced. 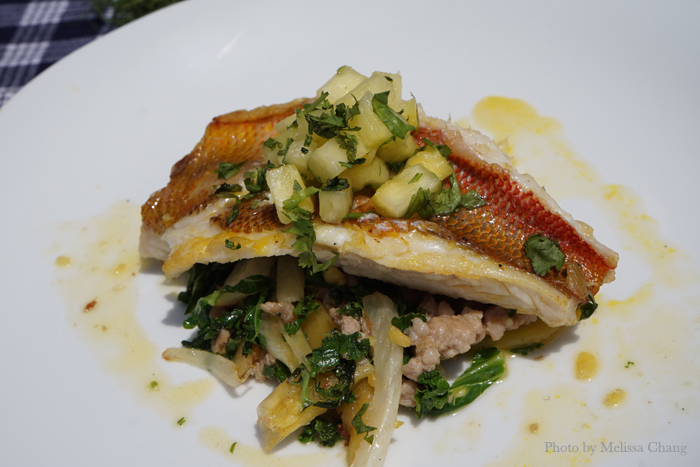 Sometimes, they are one step away from being the food source; their restaurants are adjacent to the farm, or they may be the one to have caught the fish that is now on your dinner table. 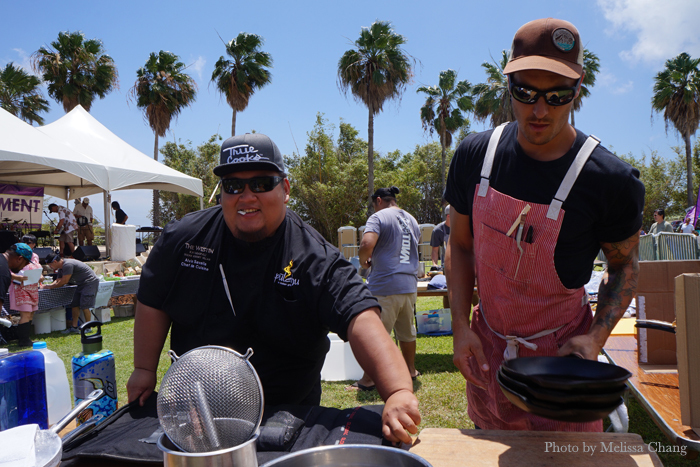 On the flip side, you have some farmers who have been chefs, and they know what they need to do to add flavor as well as nutrition to each dish. Tweezer action over the hibachi in the live chef’s challenge. The event gets bigger and better every year, too. 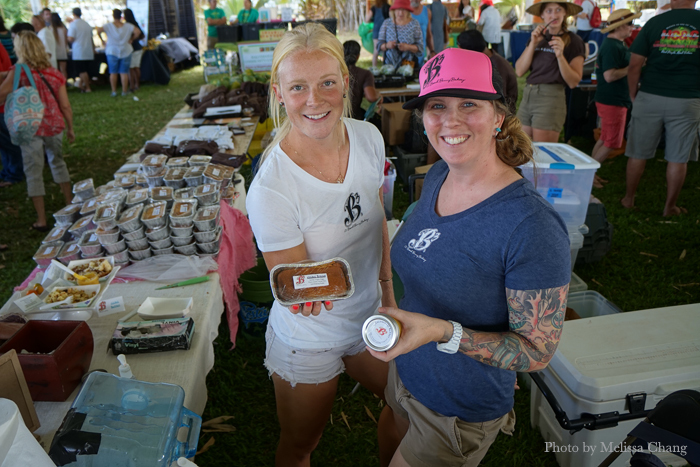 There are pony rides and a place to pet the animals, but you really want to check out the farmer’s market, where you can find a wide variety of Maui-grown products, and it’s all great quality at reasonable prices. 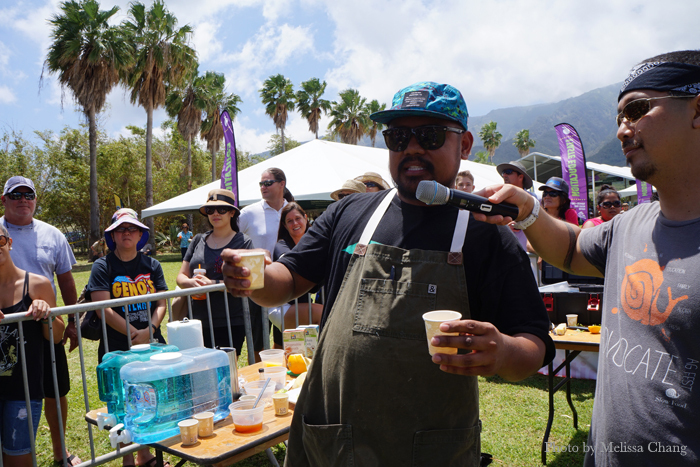 This year, there was a separate tent to showcase Maui coffee, an industry that is taking off as the sugar operations close. 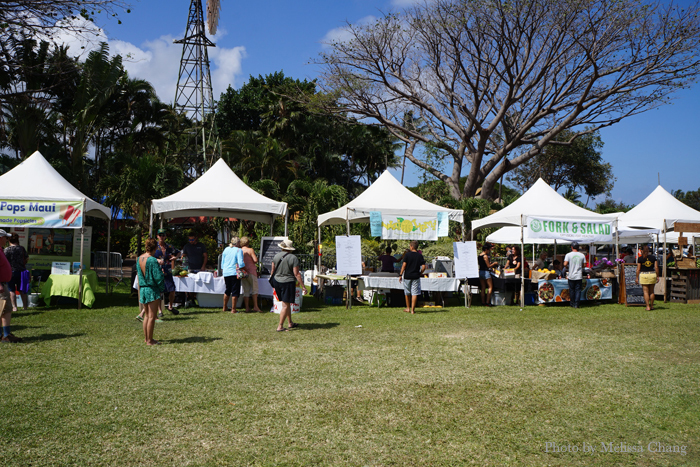 You’ll also find food booths, educational displays and activities, and plants. 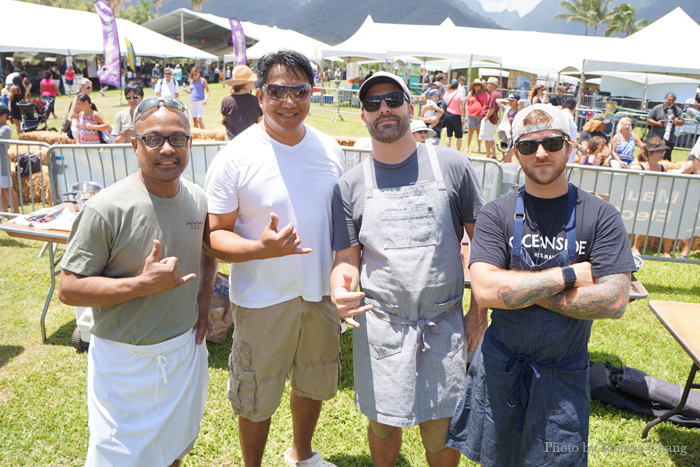 The highlights, which I got to participate in, are the live chef’s challenge (like Iron Chef) and the Grand Tasting, where the best Maui chefs show their talents using all-local ingredients on the fly. Here’s a look at that one day on Maui. Believe it or not, I was there for hours but didn’t have enough time to take photos of everything. 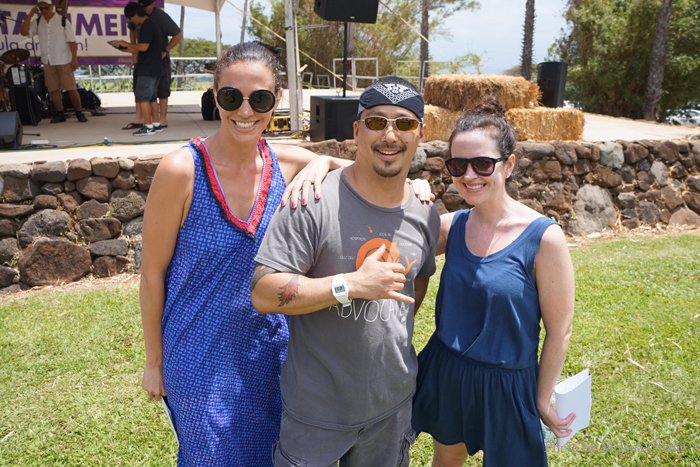 The first of two main food events: The live chef challenge, emceed by chef Lyndon Honda and judged by me, Aida Mollencamp (left) and Cindy Augustine (right). 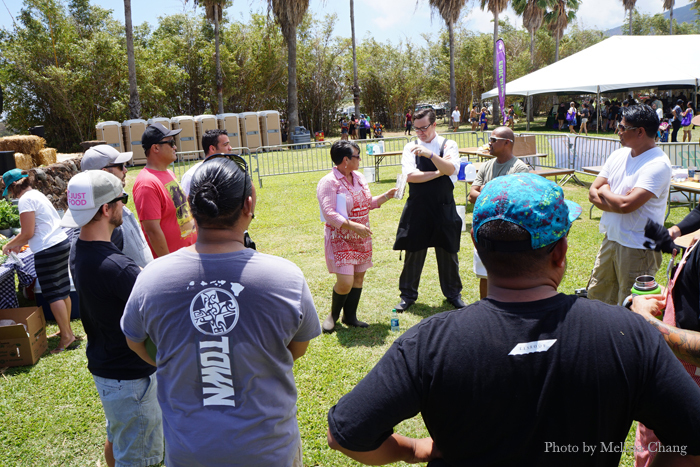 Edible Hawaiian Islands Magazine publisher Dania Katz briefed the chefs, then had them choose chopsticks to determine which team they'd be on. Dania then briefed the chefs on the various ingredients available for them to use. 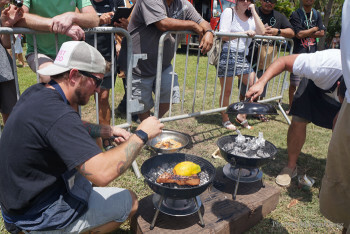 It's kind of like an Iron Chef challenge, but with more ingredients. And they're off! Alvin Savella and Jeff Scheer getting their equipment in place. Tweezer action over the hibachi! So here's the first team, from left: Michael Lofaro, Gevin Utrillo, Jeff Scheer and Alvin Savella. Michael gets done first, and Lyndon can't help but take a photo of the dish. I was later told that the chefs were supposed to use the paper plates provided, but this team had their own ceramics. Michael's lomi with ehu. He's done this before at Humuhumunukunukuapua'a in various forms, and I love that it's always fresh and bright. Gevin's fire-roasted beets and other veggies in a super fresh salad. 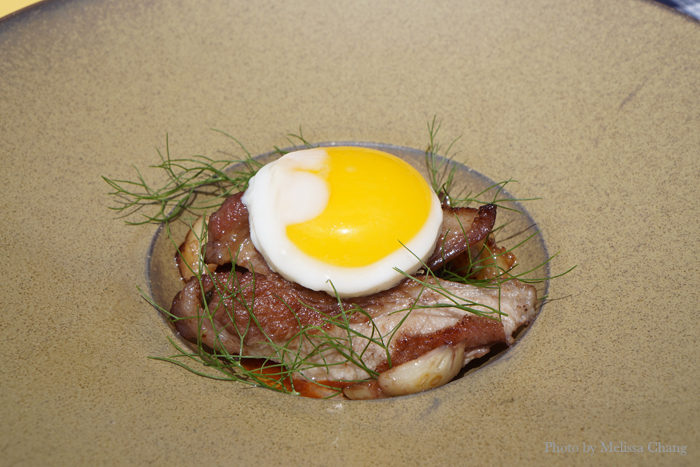 Alvin's pork belly with dill, and what I thought was sort of a barbecue sauce. It was actually loco moco-ish with punched-up flavors. 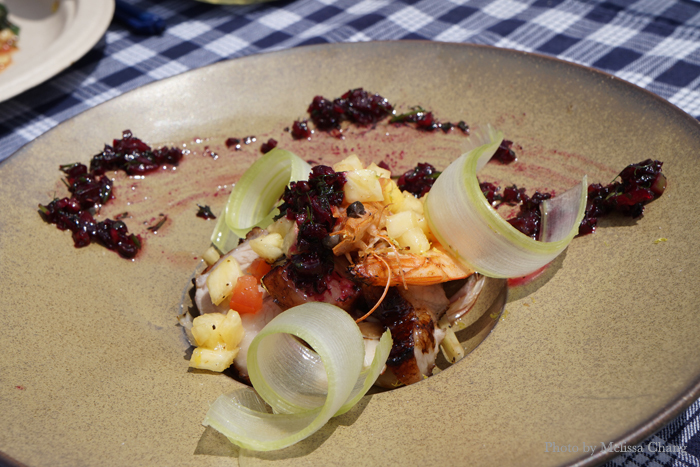 Jeff's colorful dish of seafood (octopus and shrimp) with both fruits and vegetables to bring out the sweetness was very creative. The second team, from left: Joey Macadangdang, Jake Belmonte, Gary Johnson and Gary King. Joey's "dim sum" dumplings with Kauai shrimp and local pork. This was not bad! Not Chinese, but it was a good, fusion take on it. 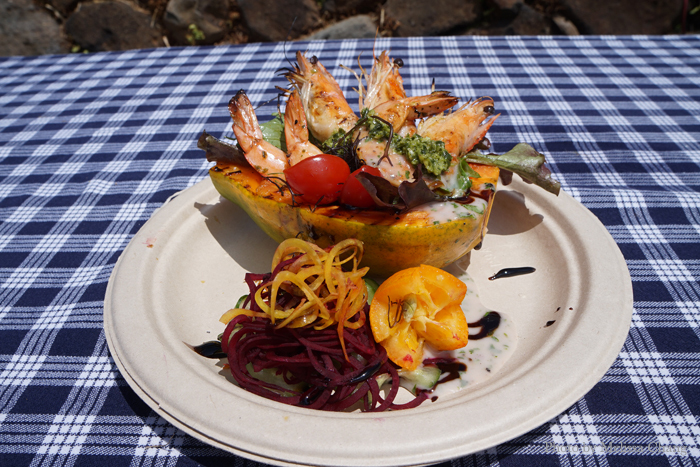 The presentation of Jake's Kauai shrimp on a papaya bowl was full of win. We all devoured the shrimp, and, I should add that I was the only one that ate the head. Gary Johnson made an ali'i mushroom broth and crispy-skinned kalekale. 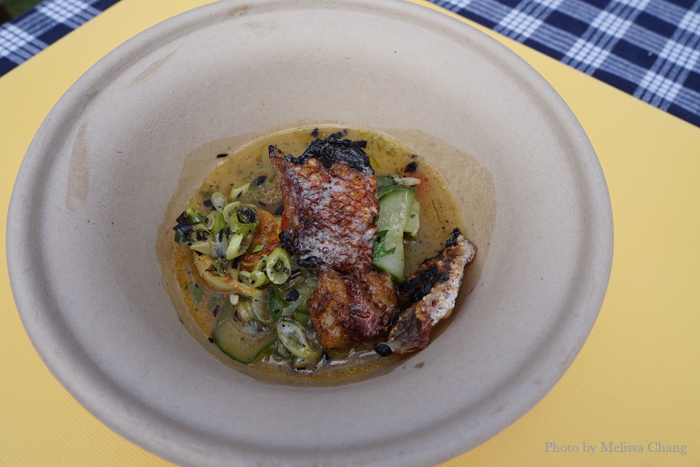 I was the last to taste this dish, and Aida and Cindy said it took a lot of restraint not to eat the last bit of fish skin and save it for me. That's how good this was! 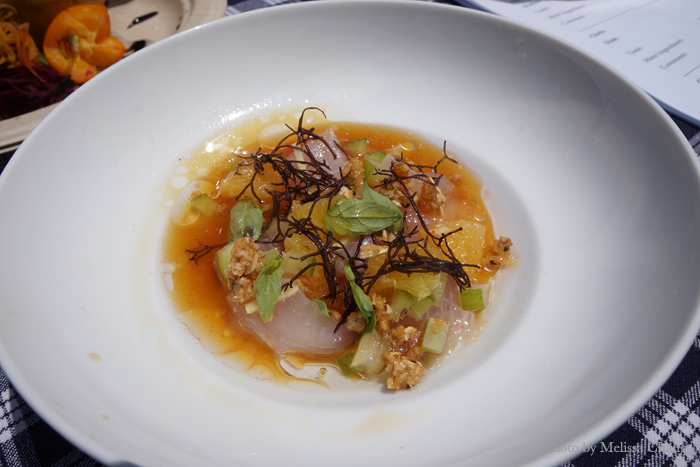 Gary King made an ehu crudo with kumquats and herbs. I've never had crudo with kumquat before, but that's one of my favorite fruits, so I was excited to try it. I was surprised that it didn't overpower the fish. Well done. 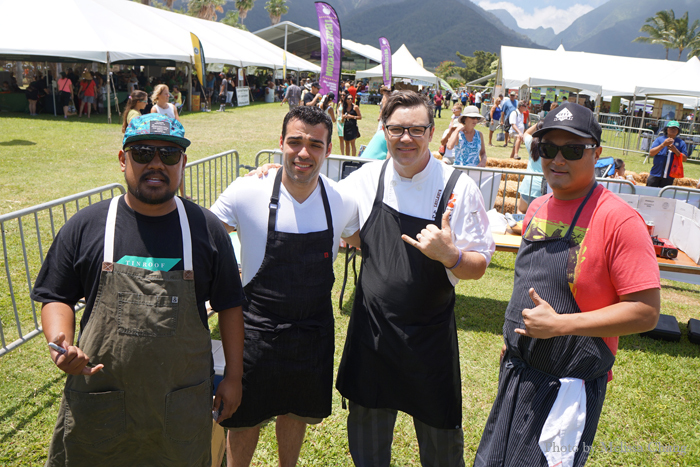 The third team (spoiler alert: the winners) was comprised of, from left: Sheldon Simeon, Jimmy Bannos of The Purple Pig in Chicago, Ryan Luckey, and Robert Andrade. Sheldon made a gorgeous plate of kalekale with citrus, seaweed, basil, ponzu and (I think) macadamia nuts. Was ono! 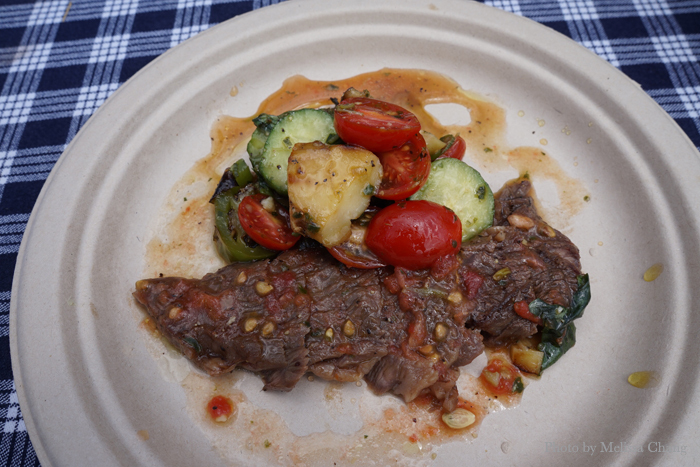 Jimmy Bannos made an Italian-style dish with Maui beef and veggies from Hana. I was in love with Ryan's kalekale with kale, which had some pork underneath to add saltiness and pineapples on top to add sweetness. I think the pineapples added a bit of surprise, but also pulled the whole dish together. With my fellow judges, food writers Aida Mollencamp and Cindy Augustine. 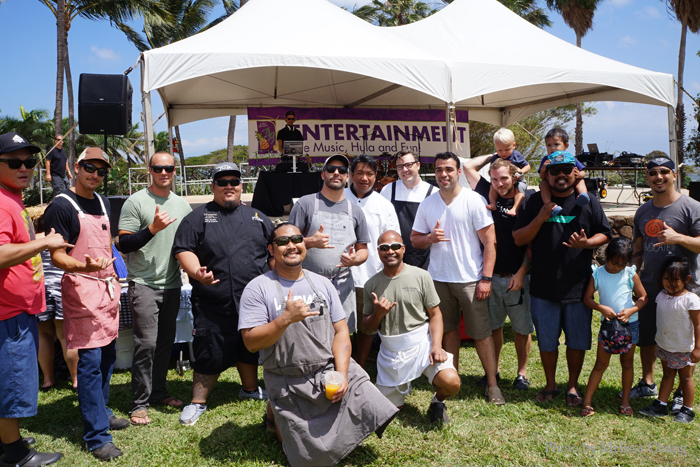 Mahalo to all the chefs! This was actually a really hectic contest. Imagine 10 dishes coming at you all at once, and you have to keep track of them and who made them! 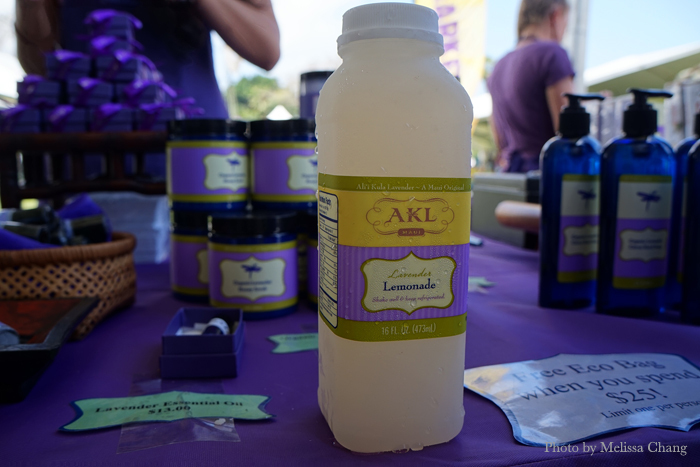 The first thing I did after the chef challenge was head to the farmer's market tent and get some Ali'i Kula lavender lemonade. This stuff is the best! 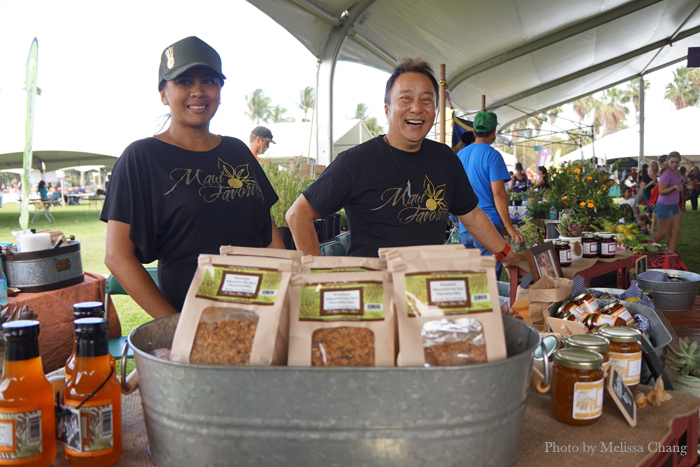 Here's one reason I love the Maui Ag Fest: I got to Evonouk Farms, which sells various fresh herbs, but they were already sold out of all their pre-packaged bags and I couldn't purchase anything from them. BUT! They had all of these trays of loose herbs, and I was welcome to take as much as I wished, for free. What?! If I had a cooler, I'd be all over that. I had to tearfully decline and leave the herbs for others. 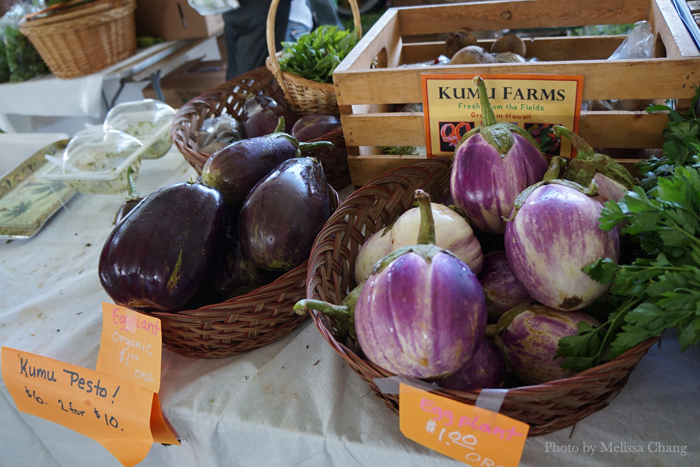 Joann Shishido showed me another reason I love the Maui Ag Fest: The produce is vibrant, gigantic, and cheap. You don't get those colors at Safeway. And if you do, it's not at those prices. Joann showed me her watermelon radishes, which are very trendy now. They have mild flavor and are popular for restaurant salads. These were bigger than Granny Smith apples! Usually I see kiwi-sized slices of these. 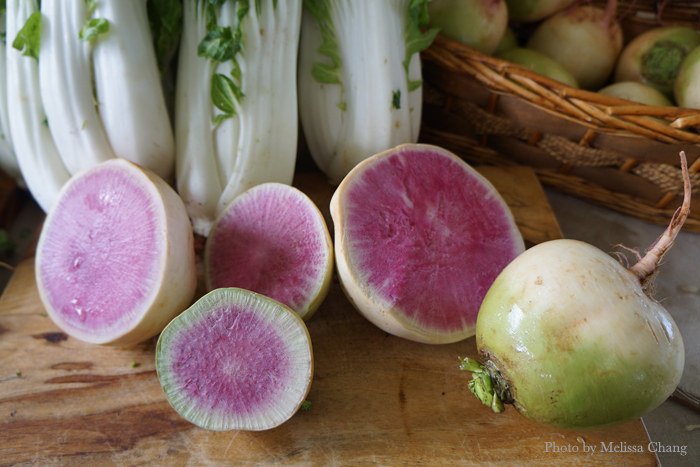 Joann's gorgeous radishes. I would have bought some if I had room in my carry on. 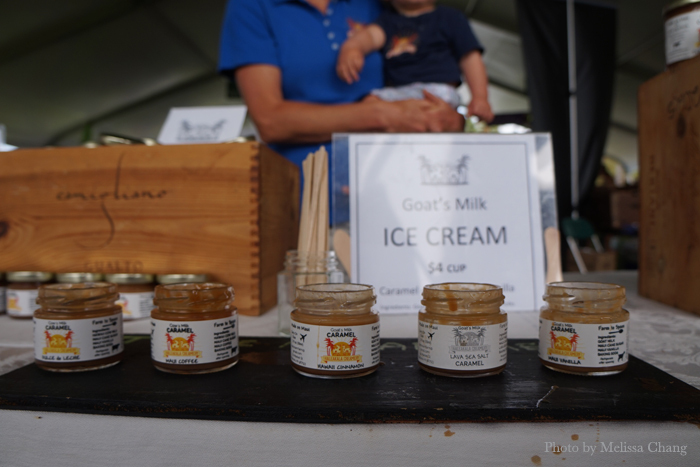 Haleakala Dairy makes caramel now, in various flavors. 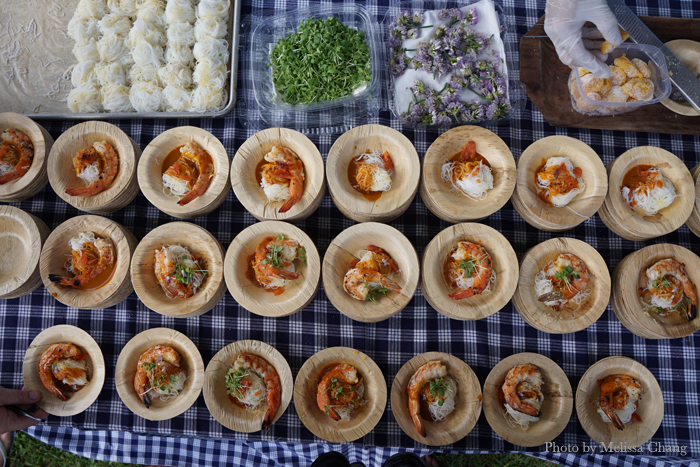 They were serving these with ice cream, which were a huge hit! Gimme that caramel! You know it's good when babies need it! 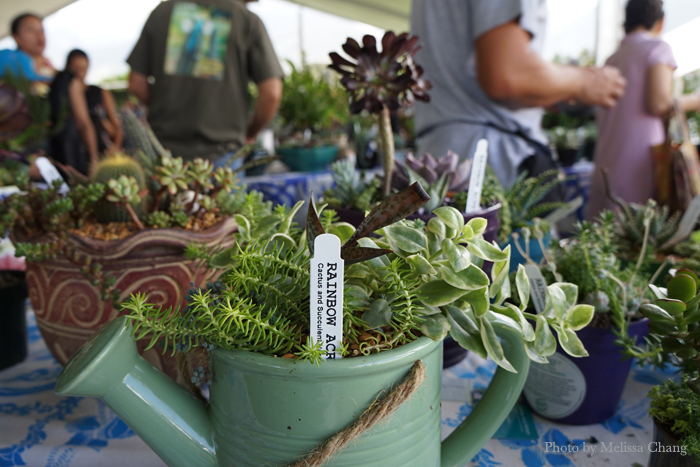 We have mini gardens here on Oahu, but none as artfully arranged as these. I love that the Upcountry jam people have diversified their products! 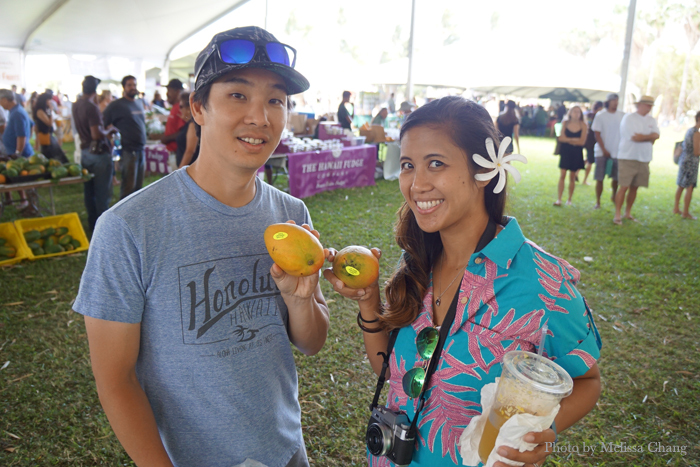 Kyu and Venus Yi with their Yee Orchard mango purchase. Wait, what? 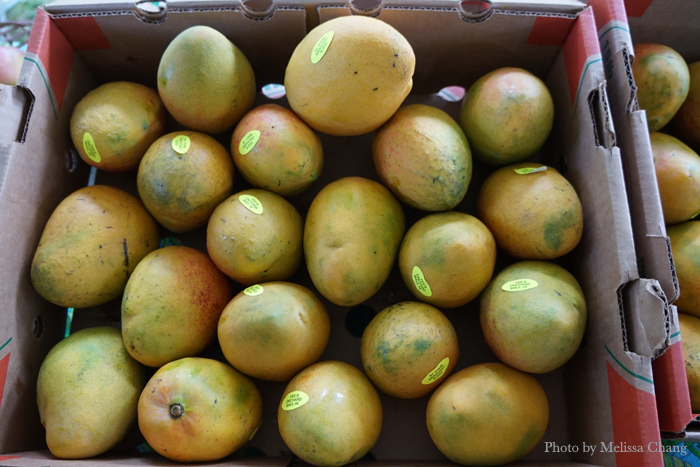 The coveted Yee Orchard mangoes are here? Golden Glow Yee Orchard mangoes. I bought four, which barely fit in my carry on. But I had to have them! 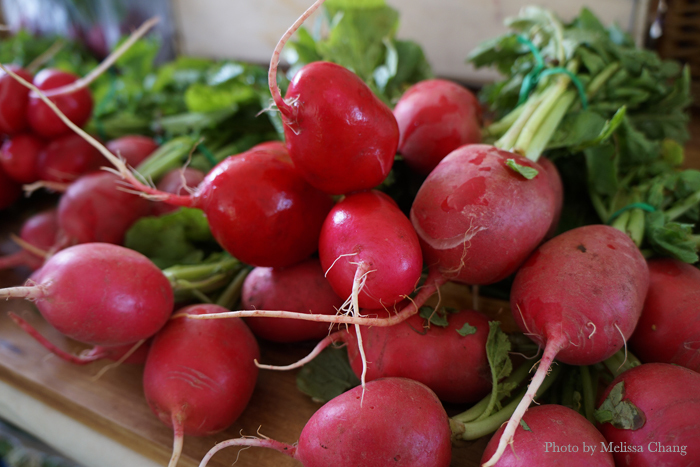 These are mild, creamy and sweet, with low fiber and small, flat seeds. 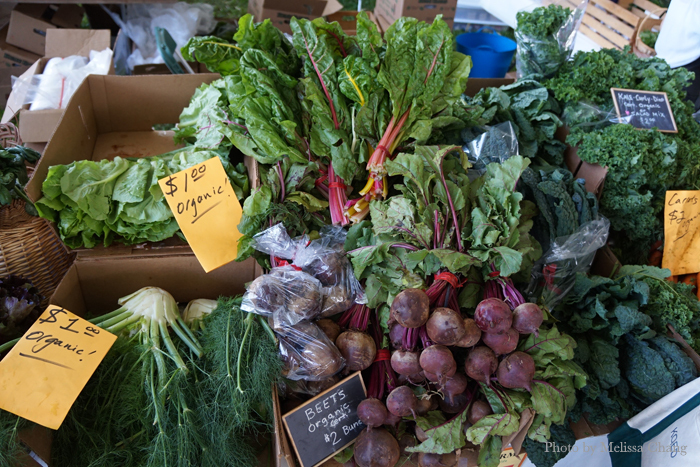 More cheap, huge, vibrant produce. I'm actually surprised they have any kale to sell, with all the hippies on the island. These ladies were selling home-made breads (some gluten-free, of course) and jellies. A close up of the jellies. Which I would have bought if I had checked luggage. 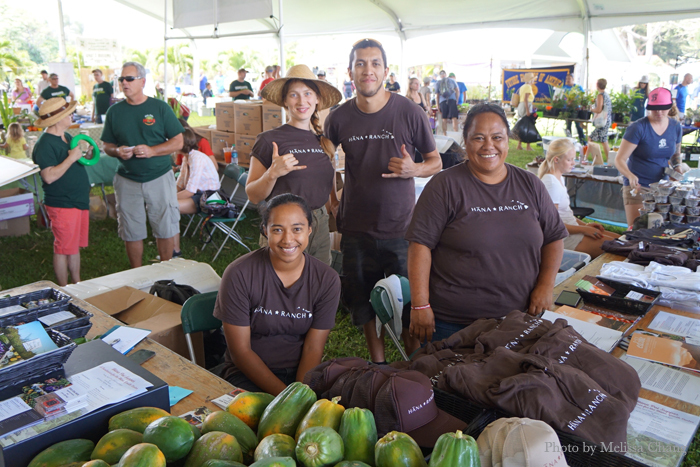 Our friends from Hana Ranch! Nice to see Pippa Harriman again! 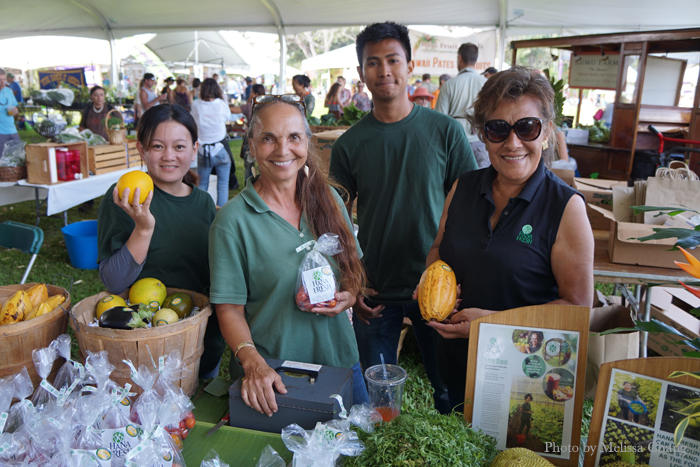 Hana Fresh was selling fruits, vegetables, and cacao! No one ever sells cacao. Not sure if you can tell, but the audience was dancing freely in the field to Uncle Willie K.
They always have some food booths and food trucks to feed the masses. The booth that sells smoke meat sold out early this year, much to my dismay. 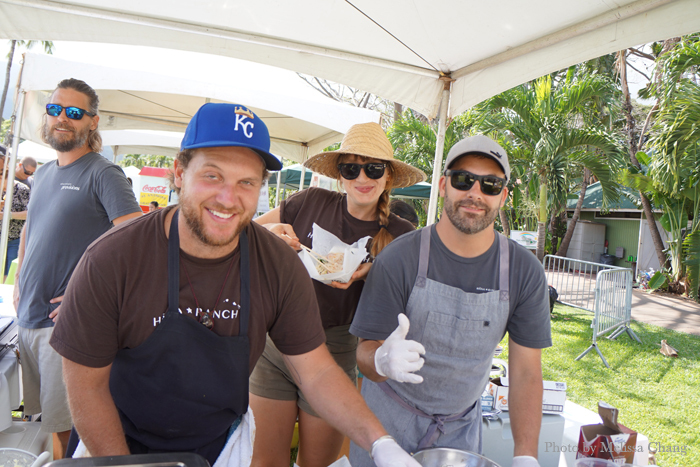 Hana Ranch Provisions serving up meatball sandwiches. Nice to see Jon Watson again, too! 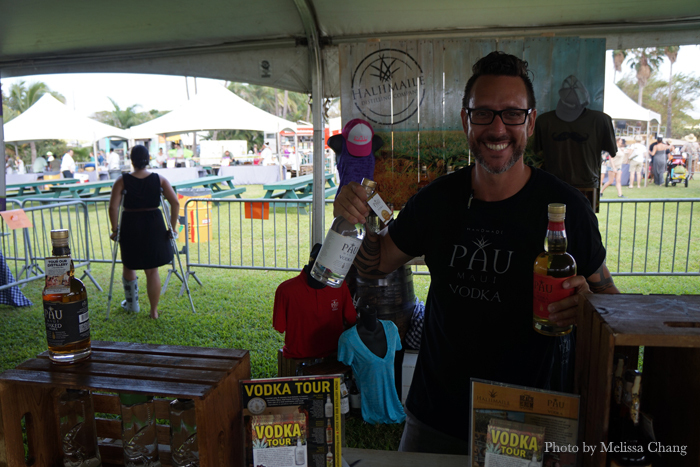 Getting ready for the Grand Tasting: Pau Mau Vodka set up a couple of tables for the 21 and over crowd. They also had wine and beer available for sale this year. 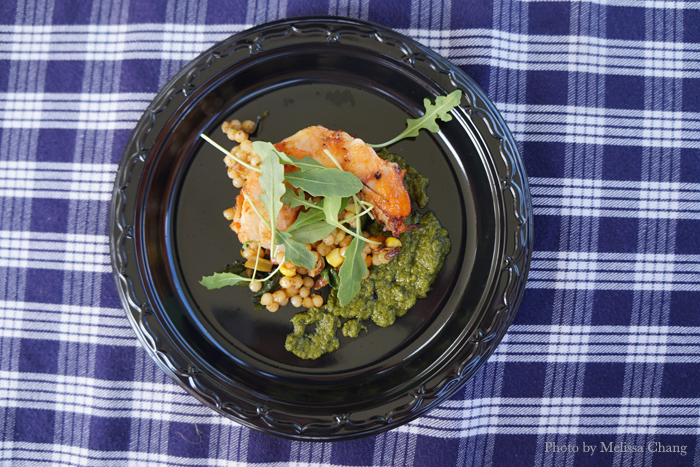 Tavis Morrin of Three's Bar & Grill made grilled Kauai prawn with wok-fried kale stems, raw corn, chard, pork belly, kabocha and a scallion-mint emulsion. You'd think that was too much flavors going on, but it actually worked. The mint kind of made me crave more of the shrimp! 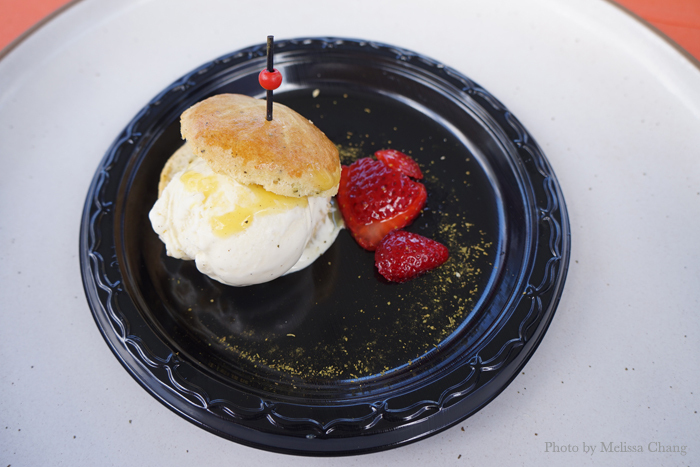 Gevin Utrillo of Japengo made moringa scones with lilikoi butter and vanilla bean gelato, topped with Kula strawberries. He was the only dessert of the day, and that was a good strategy to stand out, as he won Fan Favorite. Who would have thought moringa would be used in so many ways? 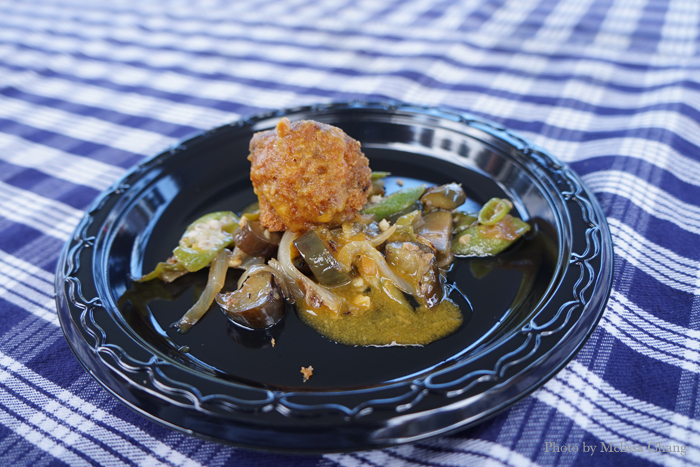 Joey Macadangdang of Joey's Kitchen made oxtail karekare croquettes with annatto-infused calabash, sili and okra. This was a nice Euro-Filipino fusion dish that brought out the flavors of the vegetables, which are more dominant in Filipino cooking. Edgy! 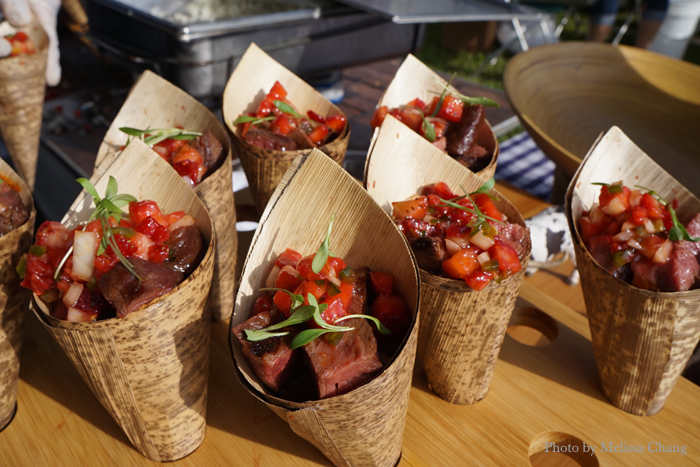 This sounded weird, but it was actually really delicious: Tylun Pang of Kō at the Fairmont Kea Lani cubed Maui Cattle Co. skirt steak and tossed it with Kula strawberries, sweet onion and shaved jalapeño. Sweet, salty, spicy all in one bite. 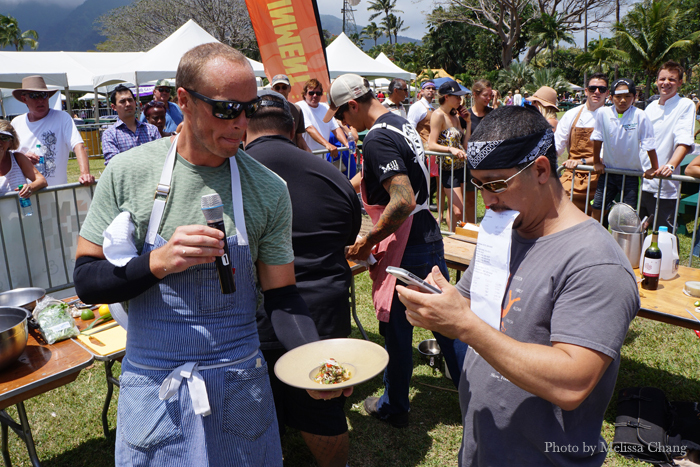 One of my favorites was by Charlie Owen of Hula Grill Kaanapali, who took kiawe-roasted pork shoulder with Maui onion gastrique, Hawaiian chili sriracha, local veggies, cheese grits and Malama Farms tasso bits. 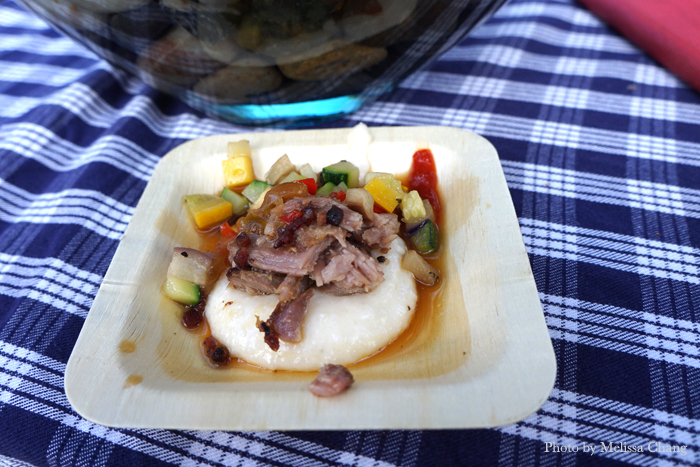 Of course pork and grits go well together, but the crunch and flavors of the veggies gave it a pop of sweetness that put a little celebration in my mouth. 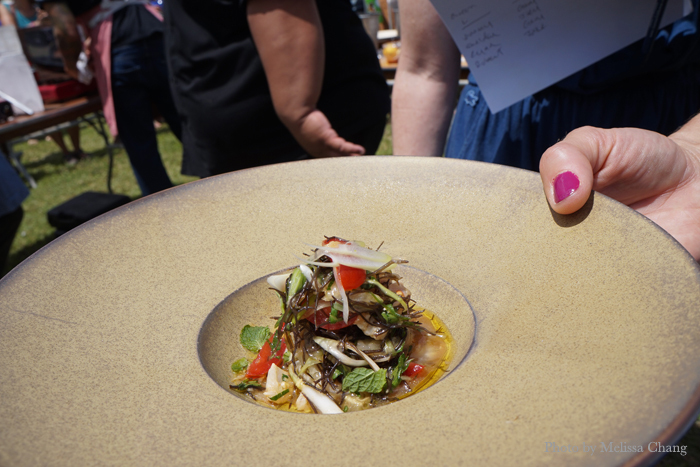 Before I read the sign at the booth Michael Lofaro of Grand Wailea was cooking at, I ate the octopus in the bowl. 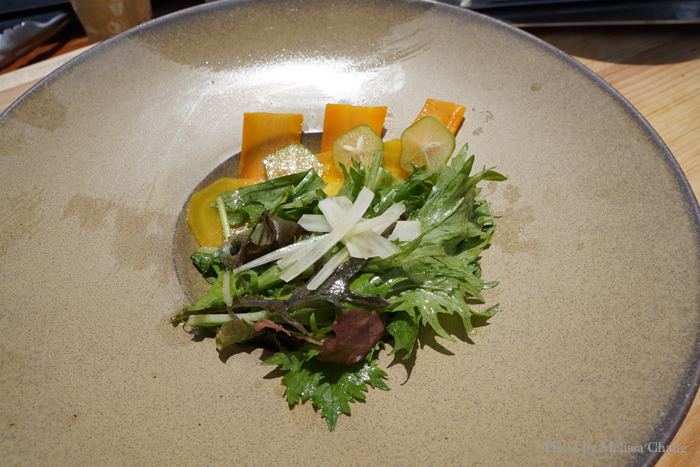 It was fresh and had a rich savoriness, then one of my favorite flavors — shiso! 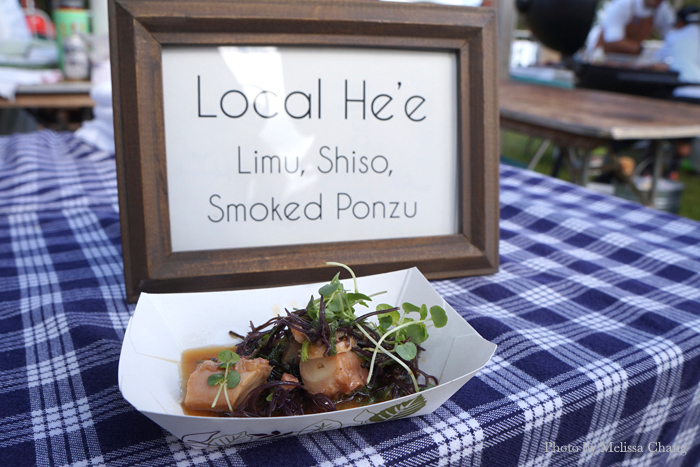 The smoked ponzu was a nice touch, too, and I actually lifted the bowl to drink it. And that's why he was the winner for Best Protein. Would I have it again? In a heartbeat. I almost voted for Jeff Scheer of the Mill House, as his dish was mighty tasty. 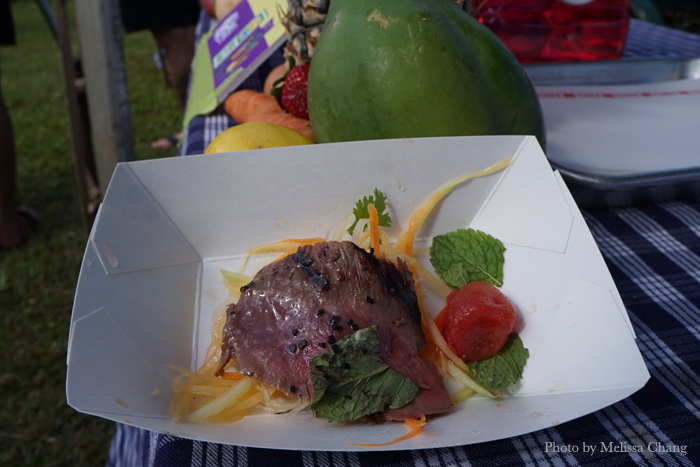 At first I thought it was a plain slab of bloom beef (which was delicious on its own), but it was on a bed of papaya salad, smoked Waikapu macadamia nuts, mint, cilantro and a bit of cheese. 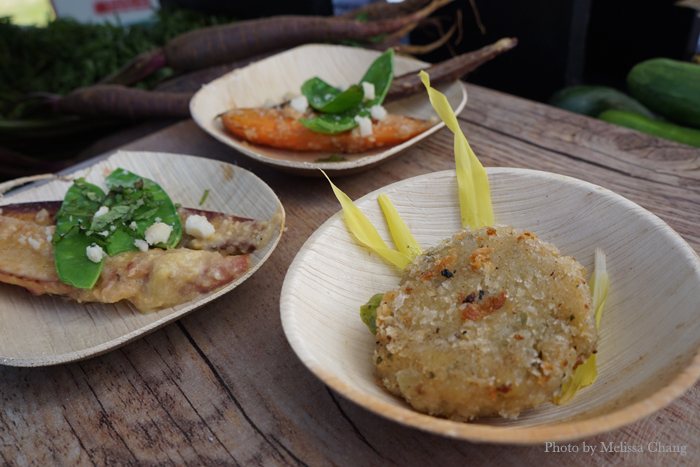 All the flavors and textures together were really nice! I don't know if I could think up such a combination on my own. 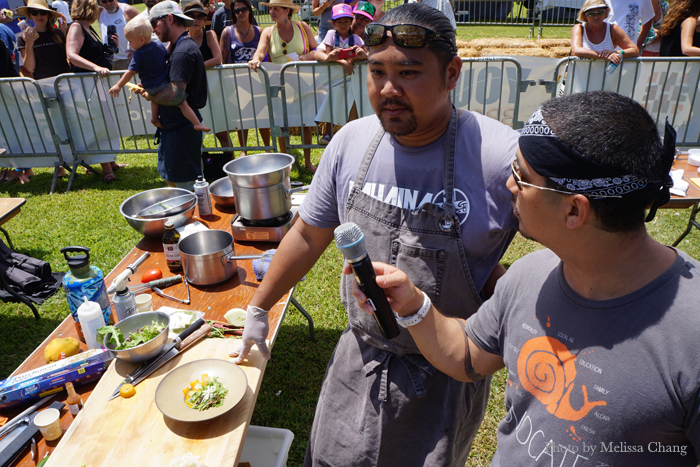 Sheldon Simeon, who is opening his new Tin Roof Maui in Kahului as you read this, was tied for Best Vegetarian dish. 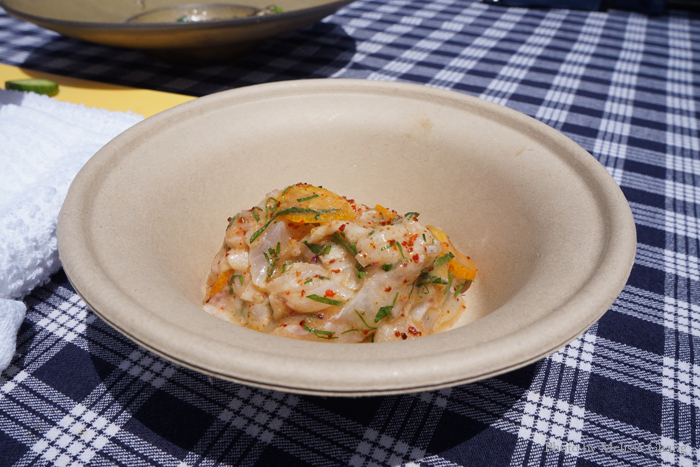 This was a stir-fry of Olapono Farms hearts of palm, citrus gel, and a sprinkle of "jerky chew." (I could swear there was breadfruit in there, too.) This was a nice twist on a familiar staple, and quite creative. 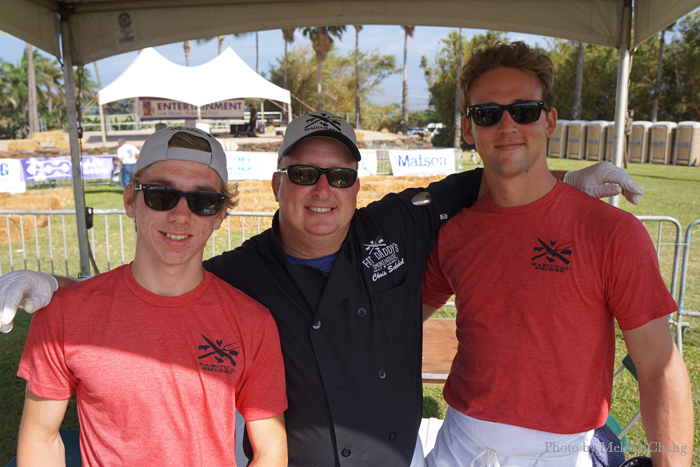 The boys from Fat Daddy's Smokehouse BBQ taking a break, with Chris Schobel in the middle. 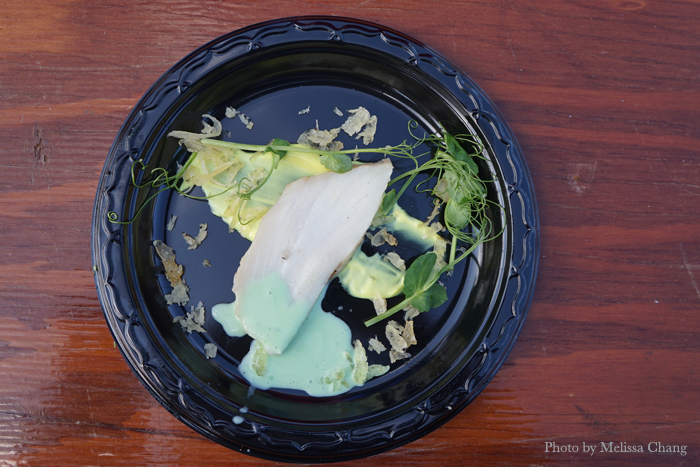 Fat Daddy's served up kiawe-smoked marlin with turmeric aioli, moringa foam, popped cassava and micro greens. At first I was put off by the bright colors, but those actually occur in nature! This was a lot more natural tasting than it looked, I promise! 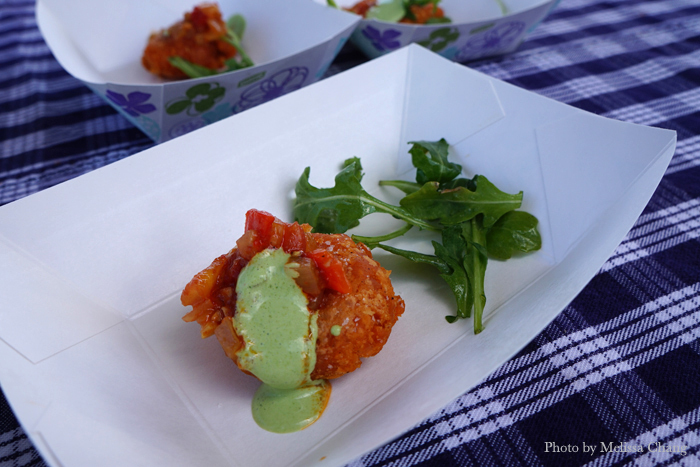 Zach Sato of Merman's Kapalua made 'ulu fritters with castelvertrano olive and fire-roasted pepper jam, and coriander creme fraiche. Again, here are so many bright colors that can be found in nature. 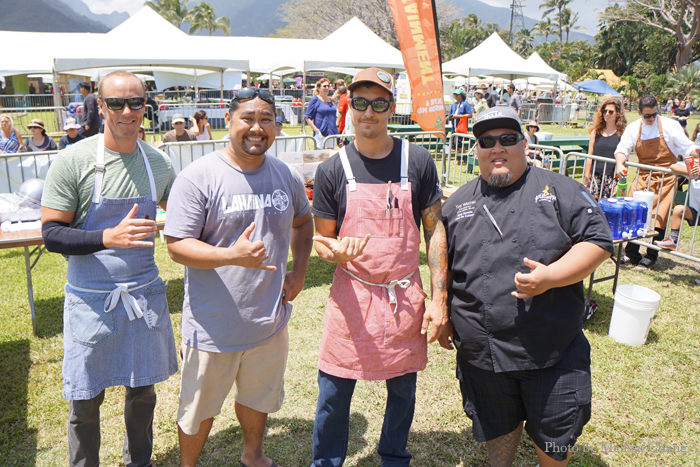 Ryan Luckey of Leilani's on the Beach was showcasing Hana Fresh produce with four dishes, which made him a shoo-in as a tie for Best Vegetarian. This one was a simple cone of cherry tomatoes with Surfing Goat Dairy goat cheese. I have never had fresh carrots like these before. 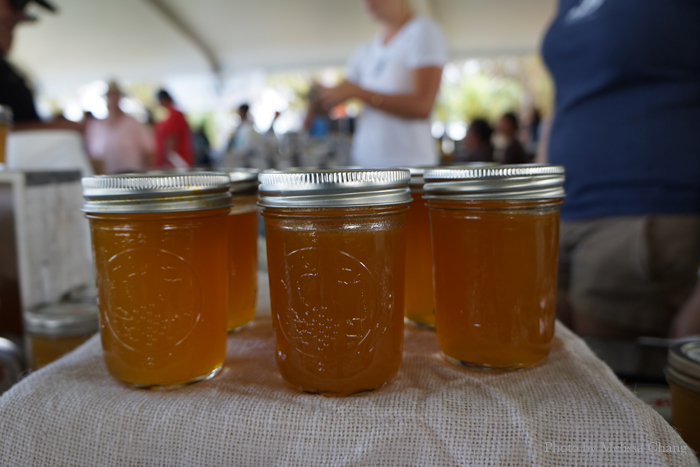 The consistency is totally different from what you get at the store! I can't even describe it, but I'd say it has a different kind of texture in the crunch. 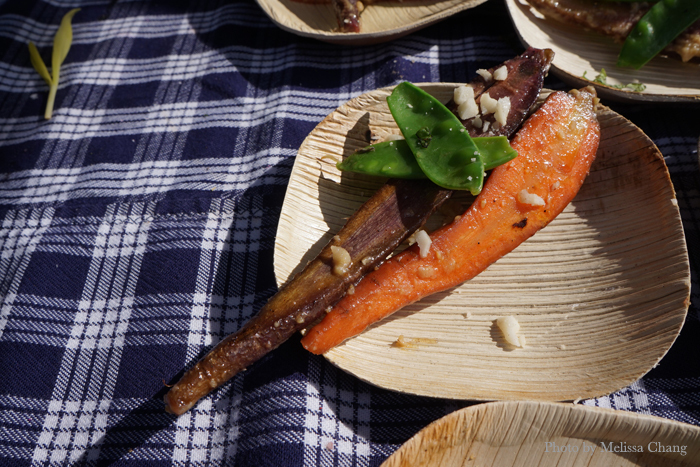 Plus, they taste a little more complex than store-bought carrots, and that's not just because of the seasoning. By the way, Hana is growing snow peas now, and Ryan was quick to point that out. 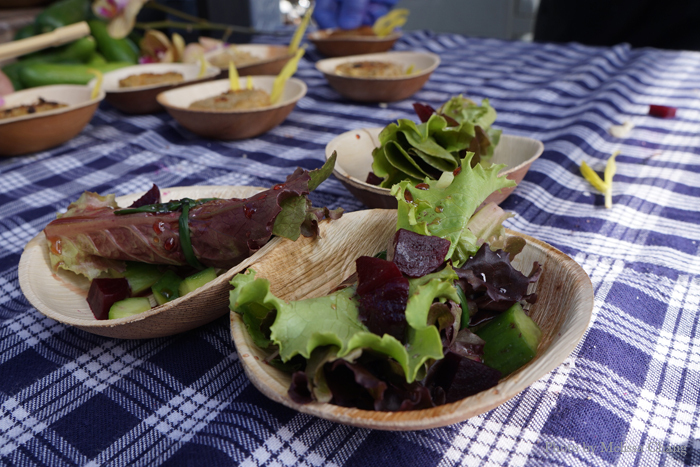 Even this simple salad with lettuce and beets was full of flavor. Writer Shannon Wianecki said they were screaming with flavor. I replied, "Yes, it's like they're still alive! Screaming, 'ooooh no eat me!'" Ryan was not too excited about that. The final plate from Ryan was an 'ulu and corn fritter on herb pesto with hana cucumber gazpacho. Even though we were full, this was worth a second bite. 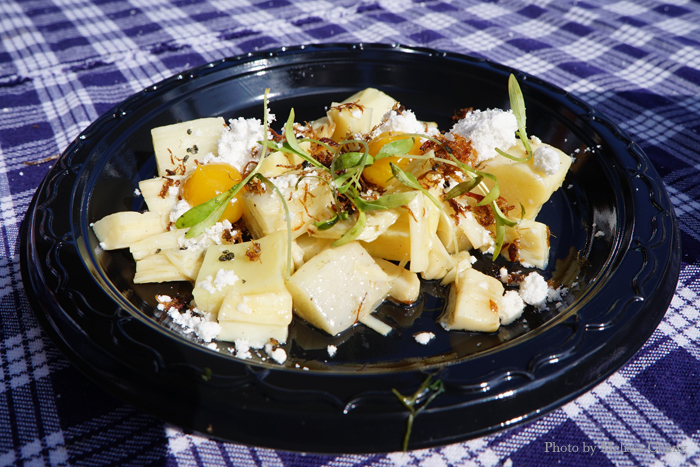 I like that 'ulu is a little sweeter than other starches, and it balanced out the pesto. …and after that, I was full! 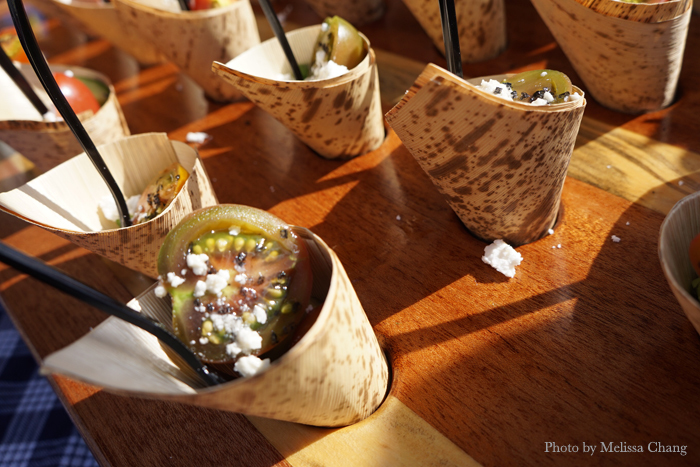 The Grand Tasting alone will fill you up. 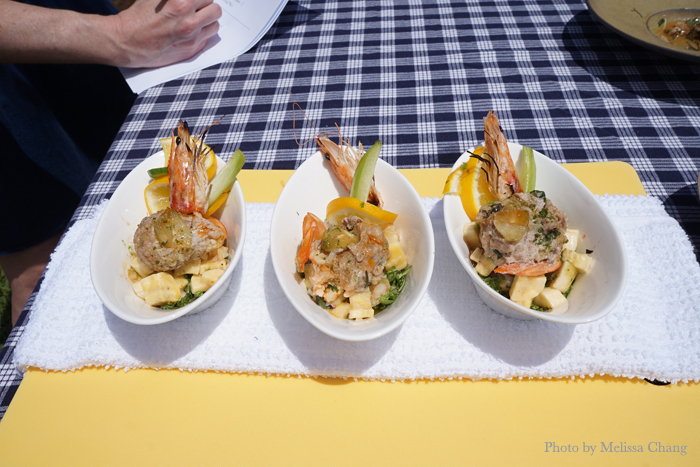 This was the first year that I was a judge, so I ate from every booth, but usually there are a few that I have to miss because there’s so much. It is worth the price of admission! 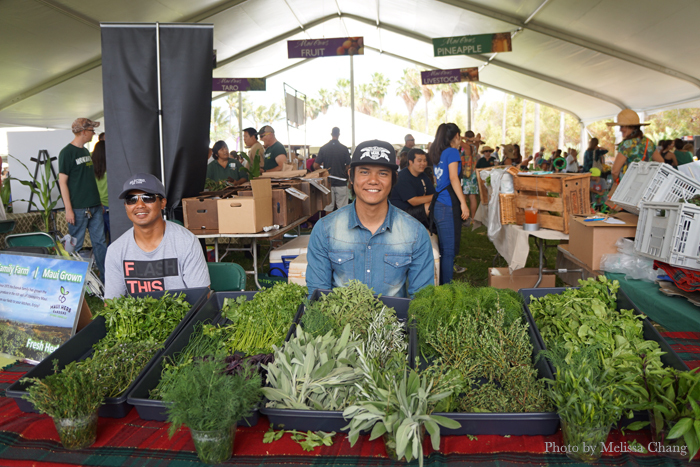 If you want to take in the Maui Ag Fest, mark your calendar for the first Saturday in April. For more information, click here. 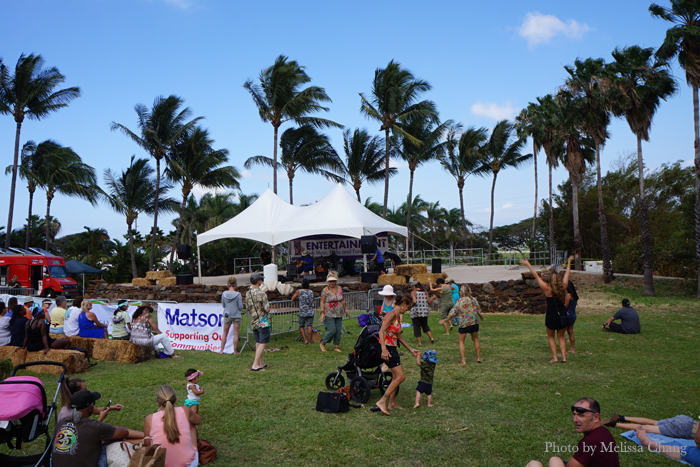 To see all posts from the public about this event, search #MauiAg on instagram.